Shoot 'Em Ups have been around since the early inception of arcade gaming. Arcade games, however, are quite another animal when compared to today's console and now mobile gaming arenas. The big difference? Arcade games were geared at offering a minimal amount of play time while providing enough incentive so as to quickly consume your quarter, but leave you willing to spend another. Today's games have to entertain for far longer than a few minutes to stand a chance. This means just getting harder and faster no longer works. Games need levels, power-ups, or a myriad of other reasons so that you want to game on. An early example of this, in my life, is a game called Astro Warrior on the Sega Master System. It was a vertical scrolling shooter that offered a variety of power-ups and levels and keep my attention for a long time. It was also a $30 game. How spoiled we can now be when a game like R-Type is available for Android phones and tablets for $2.99 (or $0.99 if you grab it while it's on sale in the Amazon Appstore). 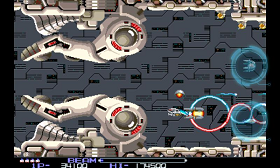 R-Type is a game that first appeared in arcades back in 1987 and is a horizontal scrolling shoot 'em up. The Android version is faithful to the original with graphics quite reminiscent with 8-bitness. The game has since made the jump to many consoles and computers and maintains quite a following today due to its difficulty and its many levels, each of which must be experienced in order to learn how to 'beat it'. As stated, the graphics for R-Type aren't anything special by today's standards. However, purists will appreciate the fact that little has changed and the look of the original game remains intact. The same goes for audio. My biggest question mark was the controls and they've addressed that beautifully. In a nutshell, your ship is constantly firing. Now I know in the past I've said I can't stand that, but in the case of R-Type it works and it works well. As for movement, your ship responds to relative 'touch and drags' meaning it mimics your fingers motion on screen and does not require that you touch the ship to move it (i.e. you can touch anywhere, drag to the right, and your ship will mirror a right movement). This avoids the problem that other games have with one's hand getting in the way. As for the game itself, it's as good as ever. I had a lot of fun working my way through some of the early levels (no, I have not beaten then game) in testing the game out. It played very smoothly and may be the best shooter I've played on my Android device. It also works well on both phones and tablets which is much appreciated when I see many companies milking me out of my money by trying to sell me the same game in both SD and HD formats versus creating one Universal app that works on both devices. This is a shoot 'em up that truly has me entrenched in the speedy arcade action and succeeds as getting my adrenalin pumping. R-Type is a good value at $2.99 and at $0.99 it's a must get game if you derive the slightest pleasure out of arcade shooters. It doesn't make any new advances, but it's an oldie and a goodie done right on a modern platform that has stood the test of time. 5/5 stars. I think we can all agree that pirates are bad news, but do you know what the biggest issue with large pirate colonies is? Yep... all that rum drinking and treasure map making can only yield... lots of pollution. Somebody has to clean it all up. Why not you? Pollushot uses a sling-shot type control called a sling-ship to catch the rubbish falling from the sky which doubles as ammunition. You then use this ammo in Angry Birds style against these menacing pirates as you sling it right back at them. You'll drag your sling-ship with your finger to catch the debris and move into position for a precise shot. Then you'll release, touch, pull back, and quickly release to destroy them. Now I'm not exactly clear on how destroying a bunch of pirate ships helps clean anything up, but I am clear on the fact that it's actually quite fun. Pollushot features engaging and smooth graphics of a variety of pirate vehicles and in an interesting twist it's not sequenced so you won't see ship #1 first and ship #2 next and so forth. The down side of that is repitition. However, this game is also quite difficult. It promises 3 worlds to unlock, but so far I'm well short of the 100,000 points needed to unlock the second world after many, many plays. Actually, I thought my high score of 36,000 was impressive. The game also features OpenFeint support and leader boards so even if you can't quite meet the 100k mark you can at least see how good (or bad) you are versus other players. The graphics and sound effects are executed well and this is a great idea for an arcade game that makes excellent use of a touch screen. The game has also worked perfectly on both my Android phone's small screen and my tablet's larger display. The only real negative to the controls has to be the screen edges. If I've moved my sling-ship to the left edge of the screen then I can no longer shoot left (I'm already on the edge) or right (I can't drag off the screen). That really should be fixed by created a small boundary for movement so that one doesn't get caught in that situation and can always fire at an angle. Pollushot is 100% arcade game and the innovation of combining a 'catch' mode (and you also get points for catching falling debris) with the sling-shot model of firing coupled with the difficulty that leaves you frustrated, but feeling like the game is totally fair translates to not only a really long sentence from me, but also an excellent arcade experience. I can also appreciate the obvious Angry Birds inspiration yet they didn't just copy that game, but created something quite different. There's something about sling-shot style combat that I think is here to stay when it comes to touch screen devices and their games. 4.5/5 stars. Super Stickman Golf was released for Android yesterday and, while I'm not going to do a full review (because it's a freebie), I will say that I played it a fair amount on my iPod Touch and it's a great little game. In a nutshell, it's 2D golf and your goal is to use your golfer and his power swing to knock the ball into a hole just like real golf. However, that hole may be above you or below you as each level isn't... well... level. The game ends up being more of a physics puzzler with a mild sports theme mixed in. Give it a try... you've got nothing to lose but some time. One blessing from Sunday's demise of my phone is that I can finally review AR Invaders. Why couldn't I before? Because the game is huge... the Market claim is 35 meg, but my full device said over 40 meg and begged me to do an uninstall immediately after downloading it. Surprisingly, it doesn't support App2SD which would seem like a cardinal no-no with a game of this size. But I've got a fresh, new phone so let's give it a whirl. 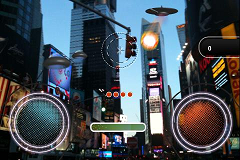 The premise behind AR Invaders is that aliens are invading and you've got to stop them for as long as you can. 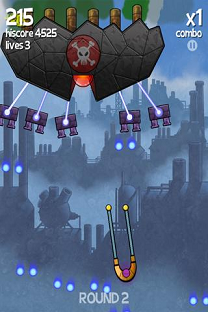 The game uses a novel approach in that it uses your phone's camera to project the alien saucers on your surrounding environment. The ads show a guy in the middle of Times Square (ok, I don't know where he is) having entirely way to much fun as he spins around to zap another flying saucer. The game sports two basic modes of play: a 180 degree mode in which you can sit down and don't have to worry about spinning around and a full 360 degree mode that requires standing and spinning. My hope for the game is that it would be much like the BeachHead 2000 game at my local Chuck E Cheese's where goggles are used to display the 360 degree environment, but I am ultimately disappointed. First things first. In the game's defense it can only be as good as your phone's hardware. I don't find that my Epic 4G has a great 'compass' in it. This game requires knowledge of your precise orientation to accurately and smoothly update the display. The bottom line for me was that the saucers just seem to zoom around way too fast for me to feel like I had any control whatsoever. Ultimately, I ended up just auto-firing and hoping I could occasionally trap one in my crosshairs. However, I also see the projection of one's local backdrop on the screen as 110% novelty. Sure it might be neato to show your friends, but after a while (aka 30 seconds) shooting saucers in my kitchen loses its thrill. Never mind the fact that on a sunny day my screen is almost washed out making me wonder what kind of device the guy in the trailer (below) is using. The graphics for the game... well, there aren't really any. It's a camera display with some animated objects superimposed on it. On the audio front the game plays a little music in the background as you play and blaster sounds are on cue. Controls rely on the aforementioned spinning and tilting your device to aim which worked poorly for me (but will ultimately depend on your hardware) and on screen buttons. So, I'm trying to imagine that everything works great and I've got precision control over aiming just like at Chuck E Cheese's. Nope, I just don't see this as any sort of long term fun. It's an interesting idea and there's a lot of novelty here (and it is just a dollar), but as for serious gaming... I don't see it. And no App2SD... that's a killer flaw. This game just isn't worth the storage space it consumes. As for me, I'd rather play Space Invaders. 2.5/5 stars. My phone had been acting flaky for a couple of months now, but I'd been too lazy to take it in to be looked at. After all, I was pretty confident it would work fine in the store and I'd be send home with a pat on the head. One example is while driving down the highways of Chicago in rush hour traffic not knowing exactly where I was going I'd take look over at my Phone/GPS only to figure out that it had locked up and hadn't updated itself for a couple of miles. And then during my last workout with RunKeeper the music had an awful lot of small skips in it which I attributed to other programs doing updates. However, on Sunday it all came crashing down when my Epic 4G became lifeless. No worries I thought... I have the insurance... which is something I'd rarely buy, but with issues I had when I first got a cell phone it seemed like a reasonable expense. When my wife needed it about 8 years ago it sure was nice to be able to go to the store and have it all taken care of on the spot (and in here case she got a phone upgrade, too!). Ok, so on Sunday I call the Sprint store that I purchased the phone at and explain that the phone has stopped working. They asked me if it had water damage and I said 'no'. They told me I could bring it in the next day and if necessary they had 'loaner phones' to keep me connected. Well, I needed to get this taken care of so I asked if there was any way I could do so today. They gave me the address of another store that was about a half hour's drive and I was off. I took the phone in and after about a 20 minute wait they took a look and immediately concluded 'water damage' and they showed me some fogginess in the lens and corrosion on the USB connector. They kept the phone to hand off to the tech and told me it would be 90 minutes. Fortunately they didn't make me stay at the store so I was able to keep myself entertained for the next hour before going back. Upon returning the fetched me my phone and told me again that it was 'Liquid Damage'. Ok, I'd heard that... what can we do. I was told to go through insurance. I asked about loaners. No. Warranty. No... 'liquid damage' is apparently my problem. I've had better conversations with my cat. I'm upset at this point as I'd had to drive around and gotten nothing in return for my efforts so I call 'my' store back, but despite a 5 p.m. close time they were apparently out of there at 4:30 p.m. as I had to leave a message. A message that still has not been returned (and no... I wasn't obnoxious... I asked whether the protocol that was followed where one guy decides it's 'Liquid Damage' despite the fact that I hadn't abused the handset forces me to use insurance). Ok, fine... insurance time... actually I thought insurance was taken care of at the store. Sprint seems to be able to bill me for it... so why can't they do the swap for it? I start to apply for my claim and then I hit the payment tab... $100 non-refundable payment! Now I'm sure this is all there in the current insurance documents and things have simply changed since I first started doing insurance, but that coupled with the fact that I had no phone for two days translates to a racket to me. I already pay $8/month for insurance or $96/year on two phones for a total of $192/year. I haven't had to use it in at least 8 years. Add $100 to the mix and if I lose a phone every 2 years I'm still ahead of the game as I'll get a new phone on the spot in the store PLUS it'll be the latest and greatest model which clearly isn't a one year old Epic 4G. So I email Sprint corporate about this after being essentially forced to pay the $100 so that I can get back on the network... after 2 days without a phone. They respond with the usual how sorry they are... they can't refund it because it's charged by another company (i.e. we have a relationship so close to them that was can collect money for them, but...) ... so I force the question of "Is this how it's supposed to be?". A customer has a phone for a whole 5 months which goes bad, and then Cristin at your store decides all by himself that it's 'Liquid Damage', and therefore no warranty for me? They won't answer that. So what have I learned from this and what wisdom am I trying to impart? First, DO NOT buy the insurance unless you have a hobby of losing phones. Even then I think it's limited to two replacements before they drop you. The Insurance for phones, as with most stuff, is a rip off and simply a money maker for them. I just cancelled mine... savings $192/year. Second, I've been trying to think for the life of me how I could have caused water damage. The only thing that really hits me is when I work out with RunKeeper I sweat. Perhaps some sweat got into the USB area? I can't explain the fogginess in the lens though. Consequently, I have returned to using my old Motorola Droid for workouts as it plays my music and executes RunKeeper just fine. Consequently, I'm not sure I'd be using my expensive phone to exercise with anymore... use that recommendation as you will. Third, my Sprint Store stinks at calling me back. This is the second time I've had to leave a message and someone hasn't called me back. The first time was due to a billing error. I don't know how much of a reflection this is on individual Sprint stores vs corporate. Corporate generally is very quick about responding to emails although I'm still waiting (it's been 24 hours) to an answer to my most recent question regarding protocols. G5 Entertainment is putting Stand O Food 3 on SALE. Puzzle games, puzzle games... puzzle games are a crowded room on mobile devices. Yes, here's another puzzle game reviewed for a crowded market of puzzle games, but this one, I believe, offers something different. Refraction is a game all about light. Have you ever seen those board games like Laser Battle or Khet in which you're moving your pieces in a chess like fashion in an attempt to fire a laser beam at your opponent's stronghold? Refraction is those games converted into a puzzle style game and more. First thing, the instructions are well written and broken into steps which I really like. What I don't like is having to read them all before playing and Refraction, fortunately, does not make you do that. The game nicely and neatly shows you what you need to know as you play almost like an interactive tutorial. In the game each level has lasers firing various colored beams of light that must reach a target. 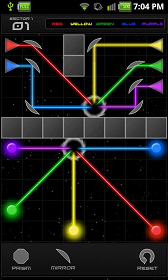 You must then place various objects such as mirrors to bounce this light around to reach its destination to complete the level. If that was it I'd say it had been done before, but the game includes the concept of different light colors and prisms that can split (and combine!) the many colors of light. Furthermore, the prisms can be adjusted more like pins on an integrated circuit to choose what comes out of where based on an input (or inputs). The graphics for the game consist of basic geometric shapes in a vector art format. Then again this game isn't geared at being a graphics or sound festival. The controls worked well although sometimes it was a bit cumbersome to remember that I had to choose toggle to select which output I'm adjusting on a prism. I think it would have been nice to allow me to just be able to touch and drag, but I do see potential challenges with that... especially on smaller screens. I also wonder if perhaps more common actions could have been used for some things such as the option of removing an object. Dragging it off of the screen makes more sense for deletion versus a double tap and would have been more intuitive. The puzzles themselves scale well and didn't leave me feeing devoid of challenge while at the same time not overwhelming me. I've played through about a quarter of them so I've got a ways to go to complete the game's 120 levels. Each level also is said to allow for multiple solutions and you can take a screen shot of a level you've completed to put on the fridge or to show Mom. One of the things I like about the game is the pseudo-educational aspect of the idea of mixing and combining different wavelengths of light into colors and this all translates into a solid puzzle game. There's a free 20 level trial in the market or you can pay about $3 for the whole thing which I think is a tad on the steep side considering the competition for puzzle games. All in all I'm a fan. 4.5/5 stars. You'd think when coming up with a name for a game company one could do better than 'Mediocre'. In fact, after purchasing the game Sprinkle for my Tegra based tablet I saw that it was just mediocre and wondered what I had just committed to, but alas it was just the company's name. I can just imagine some guy calling and saying "Hi, this is Bob from mediocre software...". Fortunately the game is far from mediocre. Sprinkle is a simple concept for a puzzle game. Put out all of the fires. You've got a little contraption that you can raise or lower and tilt at any angle and a pump button for spraying water. The starter levels are very easy... aim, fire, done. The game does get progressively more difficult at a rapid pace, though. 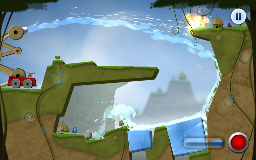 For example, around level 8 there's a block that you have to drag into position to properly channel the water so you'll ultimately be controlling more than just a water cannon. The controls are simple. Drag up and done to raise/lower your water cannon. Drag your finger next to it to tilt/aim it. And there's a big, red touch screen button to press that is out of the way of any of the action. I did occasionally sputter on raising/lowering the cannon, but, while time is important so as to inhibit the spread of fire it wasn't disasterous. It should be said that you also have a finite supply of water to add to the challenge. The graphical detail and audio are also well done. Extras like the little alien residents and their houses are drawn well and the physics of not just the water, but environmental objects such as rocks are done equally well. But, the real pretty thing about the game is how beautiful it is to watch the water slosh about on the screen. Once again, this game is only for Tegra based devices so don't think you're going to be playing it on older devices, but if you have a Tegra chipset then this game is one that shows it off nicely. There's also something innately satisfying about shooting water instead of bullets. Perhaps it brings us back to our youth when spraying a water hose on a hot day? Sprinkle is a nice game and costs under $2 ($1.47 is what I'm seeing right now) and has been a nice addition to my tablet game library. It's a shame fragmentation means this is limited to a small portion of Android owners (but it's encouraging to see they've sold over 10,000 copies of the game), but if you're in that group then grab it. 4.5/5 stars. 1) The technically savvy user that knows how to pirate stuff and think they're above buying the stuff with their massive technical knowledge. 2) The Android owner that has no clue about all the stuff their phone can do and this ignores that mysterious Market icon on their phone. 3) The Android owner that just doesn't care about all the stuff their phone can do with a handful of exceptions. Sure, they might use it as a GPS once someone points then in the right direction, but they're not going to actively seek out new games or anything. After all, it's just a phone!? You see, while Android as a whole sports great numbers the truth is that a lot of its sales are cheapie devices with people willing to spend the big bucks opting for an iPhone. Remember just how much money Apple poured into advertising that their phone has apps? Android rarely touches upon that in their advertising. Next, what the @#%$ is wrong with the Android Market. Late last week NFL Rivals came out. I'd be all over that if I could SEE it on my Epic 4G. I can see it on my Transformer table, but I really want to be able to play this on the go. But, to top it off, the AppBrain app apparently can't see it either which tells me there's a problem. Upon further digging I now find that there's A LOT of stuff I can search for on the Market that isn't found. Try 'Atari800' which is an Atari emulator. It's stuff there, but the Market search doesn't work. I wondered about this awhile ago, but now I see it's true... the Android Market search is, at some level, broken. And if I can't find an app then I can't use it. Third, I'll be honest... I'm disappointed how a free game review blog (this one) just hasn't grown much. For those wondering... it averages about 800 page view/day. I've removed ads as an experiment to make it totally free. I'm up for suggestions if you think I'm doing something wrong? My goal is 3 reviews per week, but now I'm tempted to just model myself after the countless other blogs that just print press releases for easy content instead of reviews that take actually time to create. No, I'd continue to do the reviews, but I suspect I lose readership to some of the 'news' sites by not being all encompassing. Fourth, fragmentation continues to kill. Still no tablet NetFlix and it's still a guessing game as to what's going to run where. I recently got (purchased!) a game called Let It Rip football... doesn't work properly on my Epic 4G or my Transformer tablet (although the dev states it's not ready for tablets), but how it fails is different on both. And I'm sure the game works just fine for the developer. Consequently, all I can say is... what a pain to be a developer on Android vs iOS. On iOS you have one platform to target and perhaps you have to worry about older iOS releases. On Android you've got to tackle every color and every shade of that color in the rainbow. Fifth, the lack of testing hurts. On iOS you can be assured of some basic level of quality from every app you download. On Android it's the Wild West. As much as Apple's dictatorial policies sound brutal they in turn provide the average Joe, that doesn't care about the politics, a better user experience. Sure, they can't run the freeform emulators (or what not) that I can... but I know my phone requires power cycling a lot more than my iPod touch ever did. I can see and download it now. 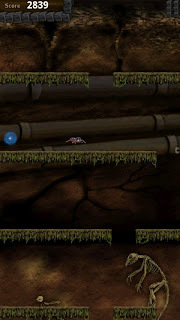 Cave Escape is an action, falldown-type game with simple tilt control. The star of this game is a brave spider entering a mysterious cave on an adventure into the depths of the earth. 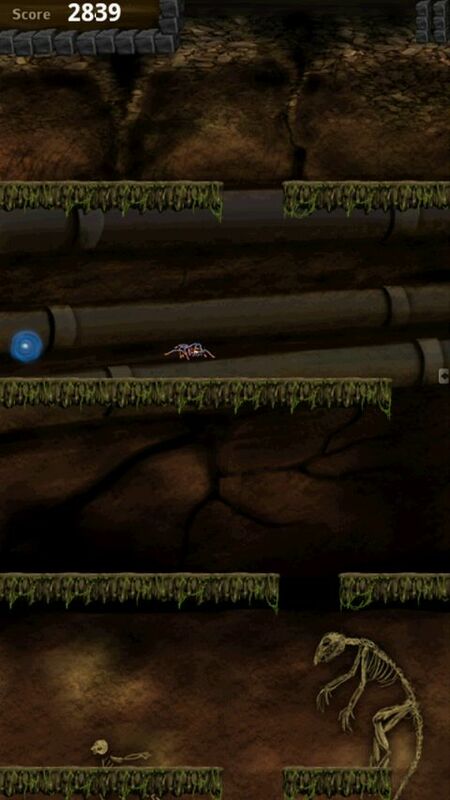 Players need to guide the spider inside the cave using the tilt of their device and avoid hitting the top of the screen. During the journey, players will discover various special items that can be used to help the spider survive, but players will have to quickly decide if that special items they found is worth to chase or is it better just to let it go to ensure that the spider stay alive. The developers wanted to give the players a compelling story presented through the graphic arts of this game. That's why Cave Escape offers players beautiful hand-drawn scenes that progresses with the players as they guide their spider deeper into the unknown darkness. Cave Escape implements a global leaderboard system using Scoreloop, to encourage global competition between players from all over the world. Players can also post their score to Facebook, just for the bragging rights to show their friends how skilled they are playing this game. Cave Escape is available for free download directly from Android Market, for all devices running Android OS version 1.6 or higher. More information about this game, including screenshots and information about the developers can be found on http://www.gemasgames.com/. Army & Maiden is a real time war simulation game in a fantasy world. You can clear a stage in about 1-5 minutes. The operations are simple. You drag the "Move Marker". Your units move to marker's places. Units automatically battle in a display. Units have differing abilities. And units have some skills. "Clear Time" and "Score" are recorded. You must aim at the high score. Let's challenge !